I loved this final chapter so much! Exquisite was the perfect conclusion to the Diamond Trilogy by Elizabeth Hayley. With an all-consuming story that wove together the best amount of heat filled spark, feels that tugged again and again at my heart, and two dynamic characters that shared so much, this book brought everything I loved about this trilogy together into one final, and exquisite package. Everything I got with Siobhan and Derick in this final chapter of their story made me love them even more than I already did, while simultaneously showing me again and again why what they share is so special. From the very first page of this trilogy until the very last, I was completely swept up into what Derick and Siobhan shared. The two of them had such an intense, real, and authentic connection that I could not get enough of. Throughout each chapter of this trilogy I have gotten to see them through every emotional up and down, every shocking twist and turn, and every all-feeling moment that pulled me into everything they were sharing even more. This final chapter brought their story to a close in a way that was fitting for them, their individual journeys, and their journey together. Through every turn of the page in Exquisite, I felt it all with Daniel & Siobhan. I felt how hard it was on the two of them that they were apart. I felt how much they both tried to fight against what they were feeling, what they knew they needed, and what they knew they couldn't live without. I felt how much they poured into the possibilities of what could be, as they both put their hearts out there, and as they saw what might be able to happen and grow between them. I felt what every turn of that page brought for them, and I truly can't say enough how much I loved it. I think what I loved most about this chapter in Siobhan and Derick's story together is that this book forced Siobhan to come to terms with what she felt, and what she was willing to fight for. The first two books of this series put a lot of that on Derick, which I loved, but this part forced Siobhan to step up to the plate in so many ways. I loved getting to be there with her as she realized what she wasn't willing to lose, and what she truly was ready to fight for, and through every word of this book with her, I grew to love and respect her character more. Not to be outdone, Derick was just as swoon worthy as ever, and I found my heart completely with that man as I read this story. What I loved about Derick was that he was so strong about what he felt, even if that meant he was going to hold back and let Siobhan step up to the plate. Derick is such a genuine and endearing man, who will melt your heart on just about every page of this book, and I loved getting to feel so much with him. 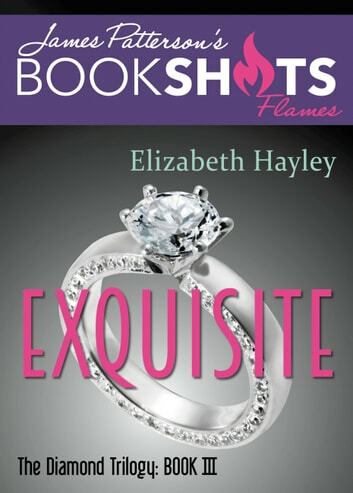 Told with Elizabeth Hayley's spectacular writing, this trilogy tells the mesmerizing story of two opposites who find exactly what they never knew they needed in each other. This trilogy is full of ups and downs, twists and turns, and more unforgettable moments than you can shake a stick at. From the very first page to the very last, Siobhan and Derick's story was heartfelt, full of spark and fire, and bursting with so much of their dynamic personalities. This trilogy was a solid, phenomenal, and beyond well written read that I loved every word of. If you are looking for a solid, fast paced, and wholly enjoyable read, then you need to run yourself to these books this very second!! Trust me. You need them in your life this second!! This was the most heart filled story of the trilogy. The characters expand the story in a beautiful plot line, and the descriptions of the locations involved bring them to life. A stunning end to this lovely trilogy.